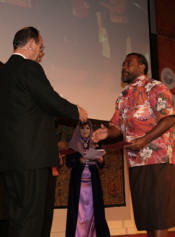 On November 5, 2007 at a ceremony which took place during the Global Forum 2007 at the Fondazione Giorgio Cini in Venice, Italy, the CTA-supported project Participatory 3D Modelling (P3DM) for Resource Use, Development Planning and Safeguarding Intangible Cultural Heritage in Fiji was granted the World Summit Award 2007 in the category e-culture. P3DM (the product) has been considered as one of the 40 best practice examples of quality e-Content in the world. The product has been jointly delivered by the following organizations: Fiji Locally-Managed Marine Area (FLMMA) Network, WWF South Pacific Programme, Native Lands Trust Board, Secretariat of the Pacific Community, National Trust of Fiji, Lomaiviti Provincial Council and the Technical Centre for Agricultural and Rural Co-operation (CTA). Download the PowerPoint Presentation on P3DM in Fiji delivered by the team. 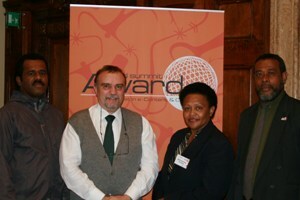 The session on e-Culture took place at the World Summit Award Winners’ Conference in Venice, Italy on 3 November 2007 and included the presentation on the award winning product “Participatory 3D Modelling (P3DM) for Resource Use, Development Planning and Safeguarding Intangible Cultural Heritage in Fiji”. 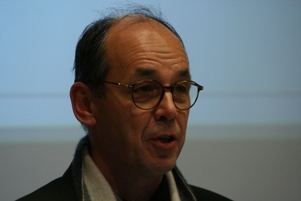 This short video documents the feedback on the session provided by the rapporteur, Dr. Paul Hoffert, Chairperson of Bell Cabada Fund, Canada and Fellow at the Berkman Centre for Internet and Society, Harvard University, USA.